Allow me before beginning the few words which I would like to address to you on the occasion of this beautiful ceremony, to thank all those who have contributed to its magnificent success. Personally, I had thought of celebrating my sacerdotal jubilee in a private, discreet manner at the altar which is the heart of Econe, but the beloved clergy of St. Nicholas du Chardonnet and the beloved priests who surround me, invited me with such insistence to permit all those who desired to unite themselves in my thanksgiving and my prayer on the occasion of this sacerdotal jubilee, that I could not refuse and that is why we are gathered here today - so great in numbers, so diverse in origin - having come from America, from all European countries which are yet free. Here we are united for the occasion of this sacerdotal jubilee. How then could I define this gathering, this manifestation, this ceremony? Homage, a homage to your faith in the Catholic priesthood, and in the holy Catholic Mass. I truly believe that it is for this reason that you have come, in order to manifest your attachment to the Catholic Church and to the most beautiful treasure, to the most sublime gift which God has given to man: the priesthood, and the priesthood for sacrifice, for the Sacrifice of Our Lord continued upon our altars. This is why you have come; this is why we are surrounded today by these beloved priests who have come from everywhere and many more would have come were it not a Sunday, for they are held, by their obligations to celebrate Holy Mass in their parishes, and they have told us so. I would like to trace, if you will permit me, some scenes to which I have been a witness during the course of this half century, in order to show more clearly the importance which the Mass of the Catholic Church holds in our life, in the life of a priest, in the life of a bishop, and in the life of the Church. This is what they taught us at the French Seminary in Rome under the direction of the dear and Reverend Fr. LeFloch, a well loved Father, who taught us to see clearly the events of the time through his commentaries on the encyclicals of the popes. I was ordained a priest in the Chapel of the Sacred Heart de la rue Royale in Lille on September 21, 1929, by the then Archbishop Lienart. I left shortly afterwards - two years afterwards - for the missions to join my brother who was already there in Gabon. There I began to learn what the Mass truly is. Certainly I knew by the studies which we had done, what this great mystery of our Faith was, but I had not yet understood its entire value, efficacy and depth. This I learned day by day, year by year, in Africa, and particularly in Gabon, where I spent 13 years of my missionary life, first at the seminary and then in the bush among the Africans, with the natives. There I saw - yes, I saw - what the grace of the Holy Mass could do. I saw it in the holy souls of some of our catechists. I saw it in those pagan souls transformed by the grace of baptism, transformed by assistance at Holy Mass, and by the Holy Eucharist. These souls understood the mystery of the Sacrifice of the Cross and united themselves to Our Lord Jesus Christ in the sufferings of His Cross, offering their sacrifices and their sufferings with Our Lord Jesus Christ, and living as Christians. I can cite names: Paul Ossima de Ndjole, Eugene Ndonc de Lambarene, Marcel Mable de Donguila, and I will continue with a name from Senegal, Mr. Forster, Treasurer-Paymaster in Senegal, chosen for this delicate and important function by his peers and even by the Moslems due to his honesty and integrity. These are some of the men produced by the grace of the Mass. They assisted at the Mass daily, communicating with great fervor and they have become models and the light of those about them. This is just to list a few without counting the many Christians transformed by this grace. I was able to see these pagan villages become Christian, being transformed not only, I would say, spiritually and supernaturally, but also being transformed physically, socially, economically and politically. Because these people - pagans that they were - became cognizant of the necessity of fulfilling their duties, in spite of trials, in spite of the sacrifices of maintaining their commitments, particularly their commitment in marriage. Then the village began to be transformed little by little under the influence of grace, under the influence of the grace of the Holy Sacrifice of the Mass. Soon all the villages were wanting to have one of the Fathers visit them. Oh, the visit of a missionary! They waited impatiently to assist at the Holy Mass in order to be able to confess their sins and then to receive Holy Communion. Some of these souls also consecrated themselves to God: nuns, priests, brothers, giving themselves to God, consecrating themselves to God. There you have the fruit of the Holy Mass. It is necessary that we study somewhat the profound motive of this transformation: sacrifice. The notion of sacrifice is a profoundly Christian and a profoundly Catholic notion. Our life cannot be spent without sacrifice, since Our Lord Jesus Christ, God Himself, willed to take a body like our own and say to us: “Follow Me, take up thy cross and follow Me if thou wilt be saved.” And He has given us the example of His death upon the Cross; He has shed His Blood. Would we then dare - we, His miserable creatures, sinners that we are - not to follow Our Lord in pursuit of His Sacrifice, in pursuit of His Cross? There is the entire mystery of Christian civilization. There is that which is the root of Christian civilization: the comprehension of sacrifice in one’s life, in daily life, the understanding of Christian suffering, no longer considering suffering as an evil, as an unbearable sorrow, but sharing one’s sufferings and one’s sickness with the sufferings of Our Lord Jesus Christ, in looking upon His Cross, in assisting at the Holy Mass, which is the continuation of the Passion of Our Lord upon Calvary. Blessed are those who suffer for righteousness sake. These are the teachings of the Cross; it is this that Our Lord Jesus Christ teaches us by His Cross. This Christian civilization, penetrating to the depths of nations only recently pagan, has transformed them, and impelled them to desire and thus to choose Catholic heads of state. I myself have known and aided the leaders of these Catholic countries. Their Catholic peoples desired to have Catholic leaders so that even their governments and all the laws of their land might be submissive to the laws of Our Lord Jesus Christ and to the Ten Commandments. If, in the past, France - said to be Catholic - had truly fulfilled the role of a Catholic power, she would have supported these colonized lands in their new-found Faith. Had she done so, their lands would not now be menaced by Communism, and Africa would not be what it is today. The fault does not so much lie with the Africans themselves as with the colonial powers, which did not understand how to avail themselves of this Christian faith which had rooted itself among the African peoples. With a proper understanding they would have been able to exercise a brotherly influence among these nations by helping them to keep the Faith and exclude Communism, If we look back through history, we see immediately that what I have been speaking of took place in our own countries in the first centuries after Constantine. For we too, are, in our origins, converts. Our ancestors were converted, our kings were converted, and down through the centuries they offered their nations to Our Lord Jesus Christ, and they submitted their countries to the Cross of Jesus. They willed too that Mary should be the Queen of their lands. One can read the admirable writings of St. Edward, King of England, of St. Louis, King of France, of the Holy Roman Emperor, St. Henry, of St. Elizabeth of Hungary, and of all the saints who were at the head of our Catholic nations and who thus helped to make Christianity. What faith they had in the Holy Mass! King St. Louis of France served two Masses every day. If he was traveling and happened to hear church bells ringing to announce the consecration, he would dismount to adore on bended knee the miracle being performed at that moment. There indeed was Catholic civilization! How far from such faith we are now, how far indeed! There is another event which we are bound to mention after these pictures of Christian civilization in Africa, and in our own history, that of France particularly. A recent event, an event in the life of the Church, and an important event: the Second Vatican Council. We are obliged to declare that the enemies of the Church knew very well, perhaps better than we, what the value of just one Mass is. There was a poem once written on this subject in which one finds words attributed to Satan showing how he trembles each time a Mass, a true Catholic Mass, is celebrated because he is thus reminded of the memory of the Cross, and he knows well that it was by the Cross that he was vanquished. The enemies of the Church who perform sacrilegious Masses in the well-known sects, and the Communists, too, know what value is to be had from one Mass, one true Catholic Mass. I was recently told that in Poland the Communist Party through their “Inspectors of Religion,” keep under surveillance those priests in Poland who say the old Mass but leave alone those who say the New. They persecute those who say the old Mass, the Mass of All Time. A foreign priest visiting Poland may say what Mass he pleases in order to give the impression of freedom, but the Polish priests who decide to hold firm to Tradition are persecuted. You think we have freedom, you are made to think that we have it, and it is the priests affiliated with PAX, who are friends of the Communist government, who spread these ideas abroad because they are propagandists for the government, as is even the progressive French press. But it is not true; we are not free. Cardinal Wyszynski gave precise details. He said that in the youth camps organized by the Communists the children were kept behind barbed wire on Sundays to keep them from going to Mass. He told, too, how vacation hideaways organized by the Catholic priests were surveilled from helicopters to see if the youth were going to Mass. Why, why this need to spy upon children on their way to Mass? Because they know that the Mass is absolutely anti-Communist and, how indeed could it be otherwise? For what is Communism if not “all for the Party and all for the Revolution”? The Mass, on the other hand, is “all for God.” Not at all the same thing is it? All for God! This is the Catholic Mass, opposed as it is to the program of the Party, which is a Satanic program. You know well that we are all tested, that we are all beset with difficulties in our lives, in our earthly existence. We all have the need to know why we suffer, why these trials and sorrows, why these Catholics are lying sick in their beds; the hospitals are full of sick people. Why? The Christian responds: to unite my sufferings to those of Our Lord on the altar, to unite them on the altar and through that act to participate in the work of redemption, to merit for myself and for other souls the joy of heaven. Now it was during the Council that the enemies of the Church infiltrated Her, and their first objective was to demolish and destroy the Mass insofar as they could. You can read the books of Michael Davies, an English Catholic, who has written magnificent works which demonstrate how the liturgical reform of Vatican II closely resembles that produced under Cranmer at the birth of English Protestantism. If one reads the history of that liturgical transformation, made also by Luther, one sees that now it is exactly the same procedure which is being slowly followed and to all appearances, still apparently good and Catholic. But it is just that character of the Mass which is sacrificial and redemptive of sin, through the Blood of Our Lord Jesus Christ, which they have removed. They have made of the Mass a simple assembly, one among others, merely pre­sided over by the priest. That is not the Mass! It is not surprising that the Cross no longer triumphs, because the sacrifice no longer triumphs. It is not surprising that men think no longer of anything but raising their standard of living, that they seek only money, riches, pleasures, comfort, and the easy ways of this world. They have lost the sense of sacrifice. What does it remain for us to do, my dear brethren, if in this manner we deepen our understanding of the great mystery which is the Mass? Well, I think I can say what we should have: a crusade! A crusade supported by the Holy Sacrifice of the Mass, by the Blood of Our Lord Jesus Christ, by that invincible rock, that inexhaustible source of grace, the Holy Sacrifice of the Mass. This we see every day. You are here because you love the Holy Sacrifice of the Mass. And these young seminarians who are in the seminary in Econe, the United States, and Germany - why do they come into our seminaries? For the Holy Mass, for the Holy Mass of All Time which is the source of grace, the source of the Holy Ghost, the source of Christian civilization; that is the reason for the priest. Let us not be borne away by all these worldly ideas, by all these currents of thought which are in the world, and which draw us to sin and to hell. If we want to go to heaven we must follow Our Lord Jesus Christ. We must carry our cross and follow Our Lord Jesus Christ, imitating Him in His Cross, in His suffering, in His Sacrifice. Thus I ask the youth, the young people who are here in this hall, to ask us to explain to them these things that are so beautiful and so great, so as to choose their vocations, whatever be the calling that they may elect - be they priests or religious men and women, or married by the Sacrament of Matrimony, and, therefore, in the Cross of Jesus Christ, and in the Blood of Jesus Christ, married in the grace of Our Lord Jesus Christ. Let them comprehend the greatness of matrimony, and let them prepare themselves worthily for it - by purity and chastity, by prayer and reflection. Let them not be carried away by all the passions which engulf the world. Thus let this be the crusade of the young who must aspire to the true ideal. Let it be as well a crusade for Christian families. You Christian families who are here, consecrate yourselves to the Heart of Jesus, to the Eucharistic Heart of Jesus and to the Immaculate Heart of Mary. Oh, pray together in the family! I know that many of those among you already do so, but may there always be more and more of you who do so with fervor. Let Our Lord truly reign in your homes! Cast away, I beg of you, anything which impedes children from entering your family. There is no greater gift that the Good God can bestow upon your hearths than to have many children. Have big families. it is the glory of the Catholic Church - the large family! It has been so in Canada, it has been so in Holland, it has been so in Switzerland and it has been so in France - everywhere the large family was the joy and prosperity of the Church. There are that many more chosen souls for heaven! Therefore do not limit, I beg you, the gifts of God; do not listen to these abominable slogans which destroy the family, which ruin health, which ruin the household, and provoke divorce. And I wish that, in these troubled times, in this degenerate urban atmosphere in which we are living, that you return to the land whenever possible. The land is healthy; the land teaches one to know God; the land draws one to God; it calms temperaments, characters, and encourages the children to work. And if it is necessary, yes, you yourselves will make the school for your children. If the schools should corrupt your children, what are you going to do? Deliver them to the corrupters? To those who teach these abominable sexual practices in the schools? To the so-called “Catholic” schools run by religious men and women where they simply teach sin? In reality that is what they are teaching to the children: they corrupt them from their tenderest youth. Are you to put up with that? It is inconceivable! Rather that your children be poor - that they be removed from this apparent science that the world possesses - but that they be good children, Christian children, Catholic children, who love their holy religion, who love to pray, and who love to work; children who love the earth which the Good God has made. Finally, a crusade as well for heads of families. You who are the head of your household, you have a grave responsibility in your countries. You do not have the right to let your country be invaded by Socialism and Communism! You do not have the right, or else you are no longer Catholic! You must fight at the time of elections in order that you may have Catholic mayors, Catholic deputies, so that France finally may become Catholic again. That is not mere politics, that is to wage a good, campaign, a campaign such as was waged by the saints, such as was waged the popes who opposed Attila, such as was waged by St. Remy who converted Clovis, such as was waged by Joan of Arc who saved France from Protestantism. If Joan of Arc had not been raised up in France we would all be Protestants! It was in order to keep France Catholic that Our Lord raised up Joan of Arc, that child of 17 years, who drove the English out of France. That, too, is waging a political campaign. Surely then this is the sort of politics which we desire: the politics of the Kingship of Our Lord Jesus Christ. Just a few moments ago you were heard to chant: Christus vincit, Christus regnat, Christus imperat. Are these but words, mere lyrics, mere chants? No! It is necessary that they be a reality. You heads of the family, you are the ones responsible for such realization, both for your children and for the generations which are to come. 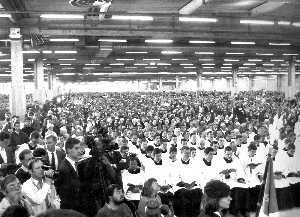 Thus you should organize yourselves now, conduct meetings and hear yourselves out, with the object that France become once again Christian, once again Catholic, It is not impossible, otherwise one would have to say that the grace of the Holy Sacrifice of the Mass is no longer grace, that God is no longer God, that Our Lord Jesus Christ is no longer Our Lord Jesus Christ. One must have confidence in the grace of Our Lord Who is all-powerful. I have seen this grace at work in Africa. There is no reason why it will not work as well here in these countries. This is the message I wanted to tell you today. And you, dear priests, who hear me now, you too must make a profound sacerdotal union to spread this crusade, to animate this crusade in order that Jesus reign, that Our, Lord reign. And to do that you must be holy. You must seek after sanctity and manifest it to others, this holiness, this grace which acts in your souls and in your hearts, this grace which you receive by the Sacrament of Holy Eucharist and by the Holy Mass which you offer, which you alone are capable of offering. I shall finish, my dearly beloved brethren, by what I shall call my testament. Testament - that is a very profound word - because I want it to be the echo of the testament of Our Lord: Novi et aeterni testamenti. Novi et aeterni testamenti - it is the priest who recites these words at the consecration of the Precious Blood - Hic est enim calix Sanguinis mei: novi et aeterni testamenti. This inheritance which Jesus Christ gave to us, it is His Sacrifice, it is His Blood, it is His Cross. the ferment of all Christian civilization and of all that is necessary for salvation. And I say to you as well: for the glory of the Most Blessed Trinity, for the love of Our Lord Jesus Christ, for the devotion to the Blessed Virgin Mary, for the love of the Church, for the love of the pope, for the love of bishops, of priests, of all the faithful, for the salvation of the world, for the salvation of souls, keep this testament of Our Lord Jesus Christ! Keep the Sacrifice of Our Lord Jesus Christ. Keep the Mass of All Time! The Catholic city of this world is made for nothing else than for the Catholic City of heaven. Thus by keeping the Blood of Our Lord Jesus Christ, by keeping His Sacrifice, by keeping this Mass - this Mass which has been bequeathed to us by our predecessors, this Mass which has been transmitted from the time of the Apostles unto this day. In a few moments I am going to pronounce these words above the chalice of my ordination, and how could you expect me to pronounce above the chalice of my ordination any other words but those which I pronounced 50 years ago over this same chalice - it is impossible! I cannot change the words! We shall therefore continue to pronounce the words of the conse­cration as our predecessors have taught us, as the pope, bishops and priests who have been our instructors, have taught us, so that Our Lord Jesus Christ reign, and so that souls be saved through the intercession of our Good Mother in heaven.